I was hoping for some actual gumbo flavor in this dish, considering it contains okra and file powder...but it tasted like a regular soup. 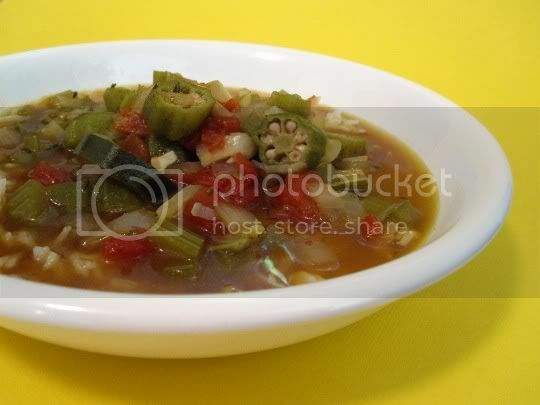 A good, flavorful, fragrant soup, but not even entering the realms of the gumbo world. So once you can get past that, you'll have an easy-to-make and surprisingly light meal. Onions, garlic, celery, and green bell pepper are sauteed, then simmered with vegetable stock, tomatoes, zucchini, okra (I used frozen), and thyme, salt, pepper, and file powder for seasoning. Although I haven't been a fan of okra in the past, it does get soft toward the end of cooking and seems to lose some of its infamous sliminess. Other than the occasional stir, you can pretty much leave this cooking with little supervision; about 30 minutes later, it's ready to eat! I served this over rice (because yes, it's supposed to be gumbo), but you probably can go without if you're just looking for a light soup. You may also want to add some hot sauce for some much needed Southern flavor. Make again? Yes, but I would NOT be expecting gumbo. Although, I think some thickening (a la cornstarch) and some added veggie links could do wonders for this recipe. "Louisiana Vegetable Gumbo," The Vegetarian Meat and Potatoes Cookbook, Robin Robertson. Boston: Harvard Common Press, 2002.